The Fast Forward Spokane plan was released at possibly the worst possible time. In November 2008, the housing market had already burst. Big banks were already well on their way to a major bailout. People were losing their jobs in record numbers. But even at the height of the Great Recession, Spokane was finalizing a significant and visionary update to its Downtown Plan. That plan turns 10 years old next year. To mark the occasion, city officials will be working with residents, businesses, community groups, and other stakeholders to revise the document with an eye toward the next 10 years of development. Naturally, there will be many opportunities for community and stakeholder engagement. To that end, until early January, we intend to take a deep dive each week into our hopes and policy desires for the 2018 update. And we want your feedback! To get your creative juices flowing, take a look at some of these notable inclusions in Fast Forward Spokane (the 2008 Plan), and consider what a bold, forward-looking downtown plan looks like in 2018. Then join in the discussion below. We’ll incorporate your thoughts and ideas into future posts. “Complete Streets” along Howard, First, and Main, including potential one- to two-way conversions along these streets. Even in this plan, a two-way Main Avenue conversion was seen as conceptual only and likely to attract opposition. These streets would also see narrowed roadways and more inviting pedestrian features. North-south streetcar linking Kendall Yards and the North Bank with the core of Downtown Spokane and the Medical District. Light rail on Riverside, with stops downtown and at the University District, before extending out to East Sprague and Spokane Valley. University District Pedestrian Bridge. It’s self-explanatory, and it’s now under construction! Urban villages in Kendall Yards and in South University District, featuring high-density housing and commercial space, with live/work options and millions of square feet of development capacity. 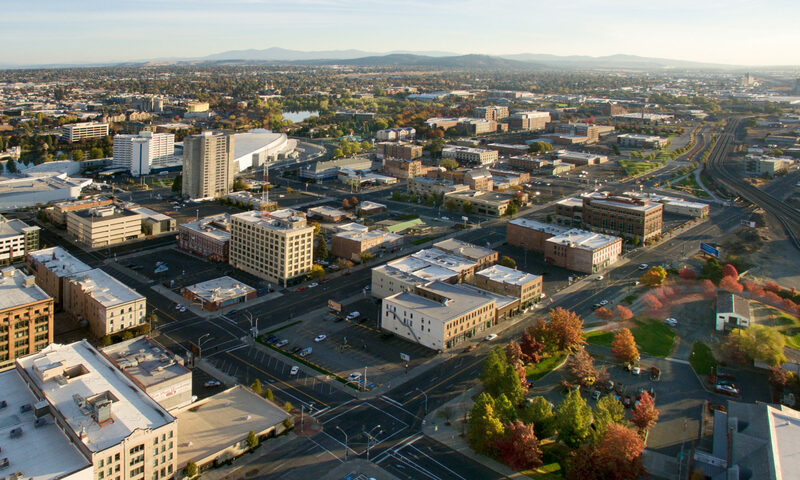 Catalytic opportunity sites called out in the plan, including the Davenport Grand site and the Macy’s Building, several properties along Spokane Falls Boulevard, and one in the West End, among others. Include sustainable stormwater management techniques in all new street redevelopment projects. Encourage green roofs on new and existing structures within Downtown. Explore systematic provision of renewable energy sources and promote integration of renewable energy technologies in new development and renovations. Adopt a policy that all new City-owned or -occupied buildings must be LEED® certified, and existing buildings be programmed to move towards and achieve certification when and where feasible. Encourage sustainable building materials and both active and passive technologies to minimize energy use. There are a number of other topic areas included in the plan, including economic development, special districts, and parks and recreation. Take a look, share your thoughts, and keep an eye out next week for Item #1 on our 2018 Downtown Plan Wishlist. SHARE YOUR THOUGHTS: What do you think? Was the 2008 Downtown Plan a forward-thinking document? What would you like to see in the 2018 revision? Share your thoughts in the comments below, on Facebook, on Twitter, or in person. Your feedback may be incorporated in future posts.